Top 15 Things About Asia that Surprised Me. 1. 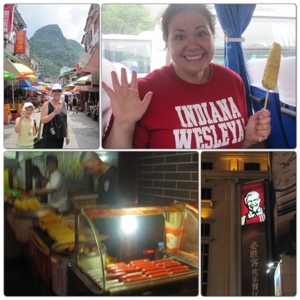 ASIA- The Land of Hot Dogs, Corn on the Cob, Ice Cream and KFC????? Be it Thailand, Cambodia, China, Korea or Japan, what did I find on every street corner, in every market, cafeteria, street vender or convenience store? Hot Dogs and corn on the cob! Ice cream cones were always nearby as well. Top that with the fact that KFC’s are more common than McDonalds and Starbucks combined, your mind just might explode. But it is the truth. For every 1 McDonalds there was at least 4 KFC’s My cambodian driver had never even heard of McDonalds or Starbucks, but there were 2 KFC’s in his small city! A month ago I would have told you nothing screams US of A to me more than Hot Dogs, Corn on the Cob, Fried Chicken and Ice Cream. I mean, all of them are literally dripping with so much American tradition it is ridiculous. However, I would say that more Chinese eat Kentucky Fried Chicken than do Americans. I mean, when was the last time YOU went to a KFC? I am not even sure if there is one in my city. Now I understand why they are on the demise in the US. KFC is concentrating all of their efforts on the Billion people in China! And don’t get me started on the number of Ice cream shops in Asia. They LOVE I mean LOOOOVVVE Ice cream over here. Well… It does, but not for long. I found it surprising that a culture that is so trained to follow rules and not question authority have NO problem violating every traffic rule known to man. Crossing the street in Shanghai was always a life and death type of experience. And there were several moments in various Chinese cities where I felt like I was Frogger. The red light on a stop light apparently does not mean stop. It means slow down, check that no one else is coming and then keep going. But, maybe I shouldn’t be surprised. If I grew up in Red China, maybe I would think Red was “go” as well. (Too soon?) Also, they have trouble with waiting in line. I don’t know how many middle aged Chinese women pushed right in front of me in various types of what I assumed to be line situations. Apparently a line is of little significance. I finally learned that you have to just respectfully push your way in. If you try to wait politely for your turn, you may be waiting a long time. 4. The Happy Room- Not so Happy. The guide at the Forbidden Palace kept calling the bathroom the “Happy Room”. And with such a cheerful nomenclature, how could I not go utilize its services. However, this was my first experience with the public bathrooms of China and I didn’t find it quite so happy. 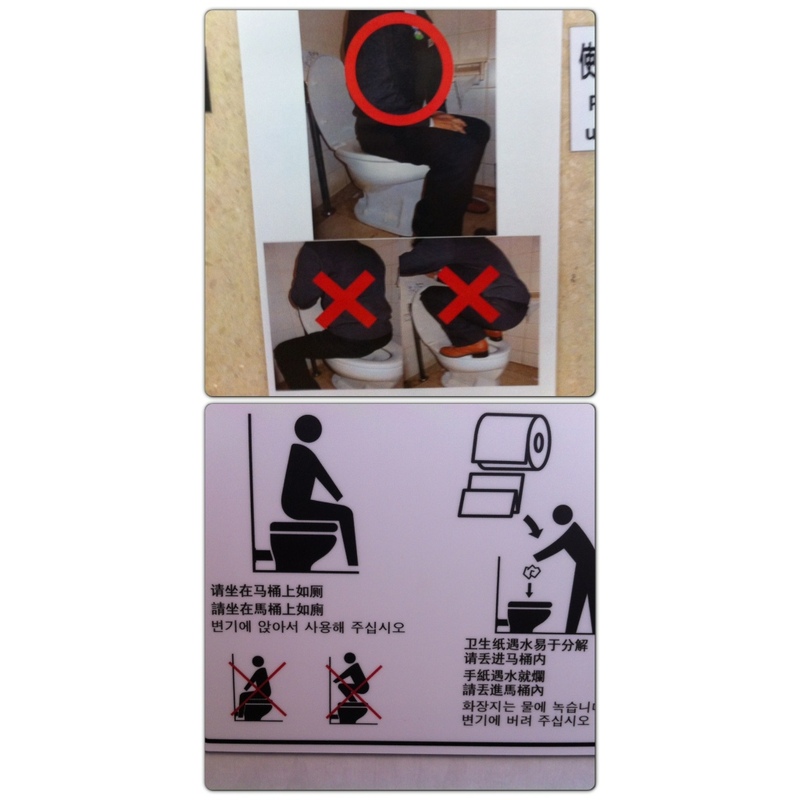 There are two things you should know before you enter a public restroom in China. The first being that there are no toilet seats- they are all squat style toilets. This seemed shocking to me at first, but I can see the logic behind these types of public toilets. There is no contact with the actual device- therefore in a way it is more hygienic. You just aim for the hole in the ground. The problem is that I am a westerner who is not accustomed to such a system and there are other westerners here as well and the floor was COVERED with…well lets call it “happy” water. The smell was quite over powering. The second thing you should know is that public bathrooms are BYOTP. Thats right. Bring your own Toilet Paper. If you are used to that system it isn’t a problem. You come prepared. However, if you are not used to this system you are kind of left in the lurch. Thankfully before I entered the stall for the first time,a Chinese woman gave me some of her tissues. In the rare event that you did run across a western style toilet seat there are helpful (illustrated) instructions on how to use such a device! PHEW! I am so glad those were there. I almost forgot that you are not supposed to stand backwards on the toilet seat. That would have been embarrassing. Not to mention difficult! I don’t think I am that talented. I got use to the Chinese bathrooms….kind of. But I was really glad to see the Happy Rooms in Korea and Japan. Their seats not only existed, but were heated! However they had so many bells and whistles on them I found them quite intimidating. For a bit in Asia I was traveling with a family from Australia. They were all blond and caused quite the stir amongst the Chinese tourists. Those who were traveling from the Chinese countryside were especially fascinated with the family’s daughter because of her light skin, blond hair and blue eyes. They would run up to her, grab her and take a photo with her. At first she was quite scared, as you understandably would be, then she got use to it. However, about 100 pictures later she got annoyed. My friend Karyn once had a lady come right up to handed her baby over to Karyn and took a picture of the two of them. It was quite funny! My friend Karyn was like…she just handed me her baby! He was the cutest little happy Chinese baby you have ever seen. ( side note, this trip has really made me want a chubby little Asian baby!). This reverse photo bombing never happened to me because I don’t look Western enough. If the sun is out, the Asian Women are under umbrellas. Their culture loves fair skin and they go to great lengths to stay pale. The hotter the weather the more covered they are. They wear long sleeves, hats, gloves, sunglasses, scarfs, even face masks to protect their skin. I almost got the feeling I was living amongst a community of vampires. The truth is that they think white skin is beautiful and that darker skin means that you are part of the working class. Therefore they will go do almost anything, to stay pale. I even saw a woman wear a full face mass and cover every inch of their body while going on their morning run. 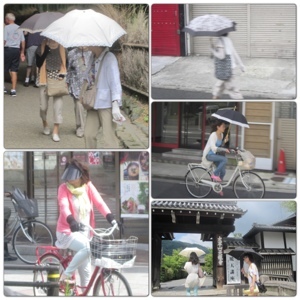 They carry their umbrellas everywhere. Some are even very talented at holding the umbrella while riding their bike, with two kids in tow. This aversion to the sun is not just for vanity, but also helps them improve their station in life. It is harder for a tan woman to get a good job in China. This is very different than the American philosophy that views tan women as relaxed, healthy and vibrant. While this Chinese practice seems to be painfully warm, perhaps this is much healthier than those who spend their summer frying their skin in an effort to look like an Oompa Lumpa. Fashion was very interesting and varied from city to city however there was one common thread. The girls wore: high heels, High collars, and High skirts. Seriously. Everyone wore high heels. I mean my feet ached just to look at some of these shoes! And the skirt and shorts were very short, but the neck lines were ULTRA conservative. I mean It was very rare to see a collar bone and absolutely NO cleavage. Almost every man in Korea dressed and looked like a math professor (Nice slacks, shoes, button down shirt and big glasses)- It drove me wild! In contrast to the women who cover up to avoid the sun, when it was hot it was very common to see men, especially old men, in China roll up their shirts up to their armpits and walk around the city, eat dinner in a restaurant, or ride the subway, fully exposing their stomachs. Up until 2008 it was not uncommon for men to go about their day without shirts. When the olympics came to Beijing, the government, in an effort to appear westernized, made it law that men had to wear shirts at all times. Therefore, this half shirt on-half shirt off is a way for the older men to cling to their past without disobeying the government. I call this the half-shirt compromise. I now know why it is very important to remove your shoes before you enter a house, or restaurant or school. 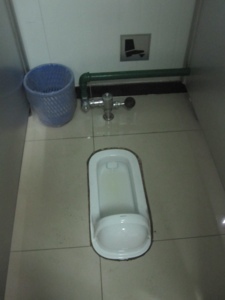 Between the squat toilets, the poor drainage systems, and the fact that it is culturally accepted in China to spit anywhere at anytime (I mean, big honking spits right in front of people. I think I almost got spit on a couple of times.) your shoes get quite filthy. I still forget to take of my shoes sometimes and I hate when I realize how rude that is to their culture. The school I visited in Korea requires its students to remove their shoes when they enter the building and wear special slippers around the school complex. And the hotel workers where shocked when I entered my hotel room before first removing my shoes. One of the spas I visited in Thailand made us leave our shoes outside of the store before we entered. It is very important to them and after living here I see why. 10. It’s not the same. The Letters and Characters of Thai, Khmer, Malay, Chinese, Korean and Japanese all look VERY different. Below is the same sentence (They do not look the same.) translated into the different languages. You can see how different they are. Malay: أنها لا تبدو هي نفسها. Korean: 그들은 같은 보이지 않는. Khmer- The Language of Cambodia is my 2nd favorite ( only after Thai). However, it is not easily translated. Below is a sample of its beautiful writing. I have no idea what this says. 11. Which side of the road? There is a major discrepancy on which side of the road is used for driving. This caused me a lot of difficulty. I never knew which side of the side walk, stairs, escalators to walk on or which way to look before I crossed the road because it kept switching on me. In Singapore and Thailand they drive on the left, but Cambodia was right. Hong Kong was left but Mainland China and Korea were right. And then Japan was left again. It is probably a good thing I wasn’t driving. 12. Breakfast is just a meal in the morning. The breakfast buffet at my hotels were always interesting. They put a mix of “western” breakfast food in there for the tourists, but the rest was filled with Chicken Terriaki, Salads, Noodles, Soup, Sautéed cabbage, fried rice, sushi, ect. I am sure it is strange to them that we have to have a “special” kind of food in the morning. To them breakfast is no different than any other meal…it is just the first one of the day. 13. The Cost is the Same. The prices may be different due to the conversion rate, but overall I have noticed that the cost of items in China and Korea are fairly similar to the costs found in the US. This was shocking to me. If something is inexpensive, it is usually made in China. Logic then follows that all of the products in China would be inexpensive. This is not the case. If you go into a mall in china and factor in the conversion rate, the price of ordinary items are pretty much exactly what they would cost in the US. Now,I will concede that food is less expensive. You can go out to eat with your friends and the cost of the meal is less than what you would pay for one meal in the US. But, products are not as cheap as I thought. In the markets I was able to barter a bit and get some prices down, but I think I was still paying the tourist price for most items. However, some items I found more expensive in Asia. 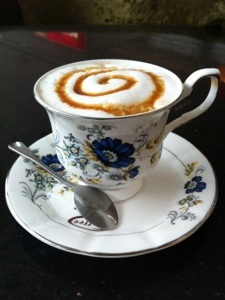 Coffee, for example, is much more expensive in many parts of Asia. (And not very good. 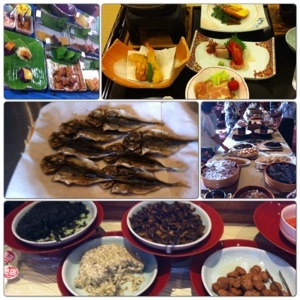 Seoul was the exception.) And EVERYTHING was expensive in Singapore and Japan. There were more coffee shops in Seoul than just about any city I have visited in the US. Almost every other building was a multiple story coffee shop. It was wonderful! Mix that with the fact that it was drizzly 4 of the 5 days I was there and you can see why I kept forgetting that I wasn’t in Seattle. However, I found out that it isn’t usually customary to have friends over to your house in Asia. You don’t often entertain guests at home- you get together at a resturant or in this case a coffee shop! Also, people are so friendly in Korea. I actually met a few people while I was at a coffee shop. I noticed a guy wearing a cap with the American flag on it. I am sure I said a cheesy joke and we started talking, I helped him with his English lessons and we became instant friends! 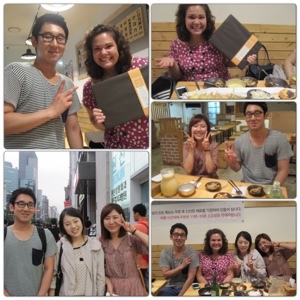 We met up for dinner the next evening and they even brought me a gift of special Korean cookies! I was quite touched! They are great people and I am so blessed to have met them! 15.Soap Operas- the Universal Show. One day in Shanghai I took it easy and stayed in my room. I ended up watching a bit of a marathon of a Chinese Soap Opera. To my amazement, after only 30 mins I pretty much figured out the entire plot-line without understanding a word of what they were saying. I also realized in about the third epesoid each one has exactly the same plot with only subtle variations. I found out that there about three things on the television in China; very dramatic soap operas, Old time China period shows or really, complicated and hysterical game shows that seemed pretty random and therefore impossible for me to follow.